Think of fishing as a popular and leisurely pastime for retirees? Think again. It’s topped a list of US civilian occupations with the highest death rate. And it’s been consistently ranked among the most deadly jobs since 1992, when the Bureau of Labor Statistics began publishing the data. Out at sea, life-threatening hazards abound, including sinking ships, people falling overboard and diving dangers. Fishing workers face dangers including sinking ships and falling overboard. Loggers were also at relatively high risk, as well as aircraft pilots, roofers, refuse and recycling collectors and steel workers. 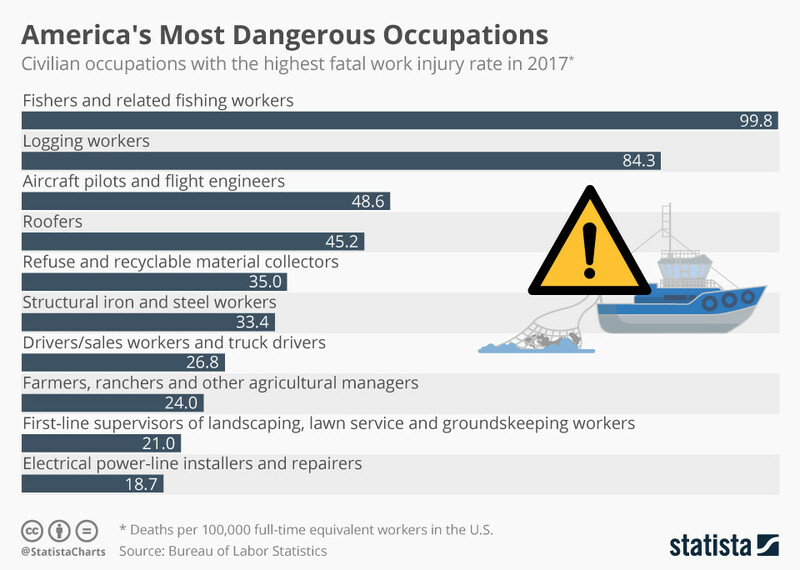 In terms of total numbers of fatalities, transportation and material-moving and construction and extraction were pretty deadly, accounting for 47% of all worker deaths. Heavy and tractor-trailer truck drivers had the largest number of fatal occupational injuries at 840. And other jobs you might not immediately think of as dangerous were mentioned. Grounds maintenance workers incurred 244 fatalities, 36 of which were due to falls from trees, and another 35 were due to being struck by a falling tree or branch. There were also signs of the times, reflecting the fact that people are working for longer – 15% of the fatally injured workers in 2017 were 65 or over, the most on record for that age category. In 1992, the first year the data was published, that figure was 8%. The data coincides with a rapidly changing world of work, brought about by the Fourth Industrial Revolution, which may have the potential to eliminate some of these dangerous roles. The World Economic Forum’s Future of Jobs Report says half of all companies think automation will reduce their full-time workforce by 2022. While the report also notes that automation may displace 75 million jobs, more than 100 million new ones could be created. Whether they’ll be more or less safe remains to be seen.